Dell announced the Alienware X51, a new small form factor (SFF) gaming PC that starts at $699. Onboard is a Intel Core i3/i5/i7 processor, a Intel H61 based Mini-ITX motherboard, the NVIDIA GeForce GT 545 or GTX 555, 4GB DDR3 (max 8GB DDR3), a 7200RPM 1TB HDD, a DVD burner or Blu-ray player, 7.1 audio, 802.11a/b/g/n WiFi, two USB 3.0 ports, six USB 2.0 ports, and Windows 7 Home Premium. As a gamer, it’s been a dream come true to lead Alienware’s product team for the majority of Alienware’s 16 years. Over that time we’ve seen some exciting innovations in the world of gaming. In 1996, video games weren’t nearly as popular as they are today. Now gamers are all around us, gaming anytime, and anywhere. 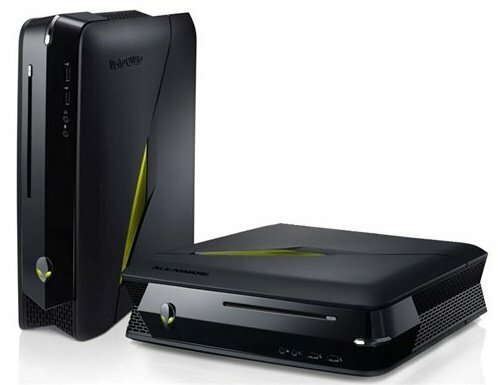 Alienware has led the charge in many of these innovations in the gaming industry. It’s now been over 5 years since Dell acquired Alienware and we’ve stayed true to the promise we made at that time: we’ve made Alienware accessible to gamers around the world and continued to deliver the most immersive game experiences possible. As gamers, we’ve listened to the enthusiast communities and partnered with game developers to deliver laptops that push the envelope of both portability and power, striving to bring the joy of PC gaming to as many people and places as possible. We’ve built a thriving online community in the Alienware Arena, giving gaming fans a place to connect with each other, with our gaming partners, and with Alienware, while helping our fans to explore the world of competitive gaming. At Alienware it’s always been about the gamer, listening to what the gamer needs, and riding to the occasion by delivering products that meet those needs. Since we’re gamers ourselves this is more than a goal, it’s our passion. As gamers, we want those very same things. We want products that stay true to the Alienware promise of delivering an immersive experience – we want the performance, customizability, upgradeability, craftsmanship, service, and quality that Alienware is known for. The community has asked for a more efficient gaming system for quite a while now. Gamers crave a system that delivers the Alienware experience in a smaller and more versatile form factor to meet the needs of today’s different environments – from the dorm room to the game room (I mean “office”), or wherever else gaming can be enjoyed. We want a system that is versatile enough for both work and play, but most of all, we want the experience to be as accessible as possible. I’d like to introduce you to the new Alienware X51 – our latest innovation designed to address those very needs! The X51 is Alienware’s smallest gaming desktop ever produced, and yet is powerful enough to give gamers the freedom to do it all – play modern games, immerse themselves in PC hobbies and tasks for work or school, or even create an entertainment hub by integrating it into a home theatre setup for watching Blu-ray movies with 7.1 surround sound. The X51 delivers incredible power for its streamlined size, featuring Intel’s powerful 2nd generation Core I processors, NVIDIA GeForce GT or GTX class graphics cards with GDDR5 memory for intense gaming performance, Wireless-N technology for easy internet access, HDMI 1.4 for connecting to 3D TVs and watching 3D Blu-ray movies, along with SuperSpeed USB 3.0 for blistering fast data transfer to other devices. In true Alienware fashion, no detail is overlooked. The Alienware X51’s chassis is designed with flexibility and style in mind. The desktop’s sleek matte black finish with dark chrome accents and three customizable lighting zones create a distinguished appearance and make a statement wherever it is used. Its dual-orientation chassis allows gamers to set-up the unit in either horizontal or vertical positions to customize the X51’s footprint for whatever space you may have available in your home entertainment area. It is also fully upgradeable, allowing X51 owners to quickly perform their own hard-drive, graphics, and memory upgrades quickly and easily, giving customers the added piece of mind that their X51 has added longevity. Like all other Alienware systems, the X51 comes with the Alienware Command Center, allowing users to quickly and easily access exclusive Alienware applications, AlienFX lighting effects, and the AlienFusion power management system. AlienAdrenaline, a new module for the Alienware X51, enables gamers to create unique profiles which launch a series of events when activated, such as closing unnecessary programs to enhance performance, opening predetermined web link, and more. Updates and new releases directly download into Command Center, giving gamers easy access to what they need to modify and personalize their system. Today, along with the new Alienware X51 introduction, we’re also introducing the new Alienware Gaming Services offering, which enable gamers’ lifestyles by providing services that support the latest games on the market and come with a “No Fix, No Fee” policy. Services offered include New Game Setup, Game Performance Optimization, Game Customization and Personalization, and In-Game Troubleshooting. Alienware X51 is available now on Dell.com and Alienware.com with a starting price of $699 USD. Alienware Gaming Services is available in the U.S. and Canada at this time.